A couple weeks ago I showed you some of the sample sheets from playing with our Gel Press. The ones I used here were not included as they looked more like something I made using our Silks, Media Tray, Color Splash Sheets, and water. I did use our Color Splash Sheets but also some of our Liquid Colors, Catalina Splash, Limeade Splash, and Lemon Drop. I started with a base of Pumpkin Bread card stock then added a layer of Turbo Teal that was embossed with our Beach Towel folder. The funky watercolor piece was die cut with our Ovals die set and splattered with Bronze Silk, then adhered. 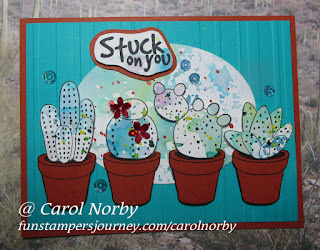 I stamped the cacti tops from our Stuck on You Bundle stamps on the rest of the background oval piece, detail cut and flicked with Turbo Teal, Sour Lemon, and Electric Lime Silks. 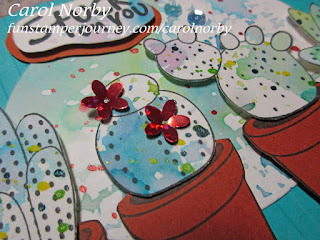 I stamped the pots on Pumpkin Bread card stock and detail cut. I determined my spacing and used Foam Squares to adhere to pots. 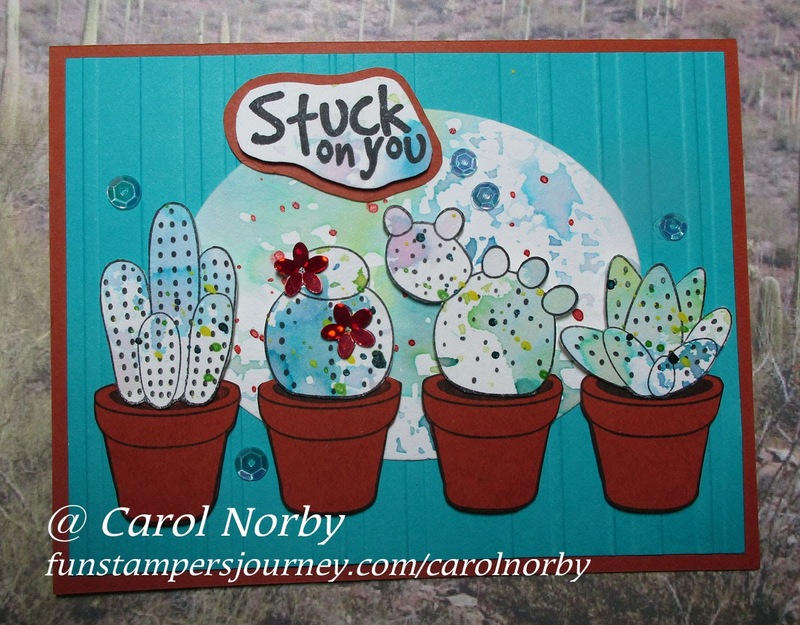 I then determined which cacti top went where and adhered in place. I stamped the text on another left over piece of the background oval with Black Licorice ink, cut it out, layered it on a piece of Pumpkin Bread and adhered in place. A few Blue Skies and Holiday Elements sequins and this card is ready to use!